Rockin' it Out: The Jackson.............4? No, we're not having twins. However, a highly anticipated visit from our friends Mark and Elisabeth Jackson (brothers with different mothers, and fathers as it turns out), was finally realized in July after the craziness of the end of our school term commenced. Just to brief you, Marisa and I interned with Mark at Georgia Tech Christian Campus Fellowship back in 2005-06. Mark and I were roommates that year and we performed weekly announcement skits for our Devotional Lunch which was always a blast. Elisabeth was also involved in GTCCF so we were all in good company. 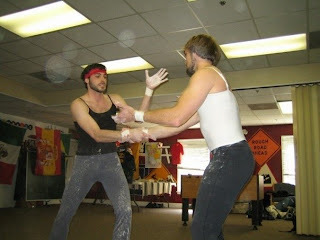 Devo lunch skit featuring "Giussepe" (Mark) and "Heinrich" (me) as performers at the circus that was in town that week. This is how ridiculous it was every Monday. 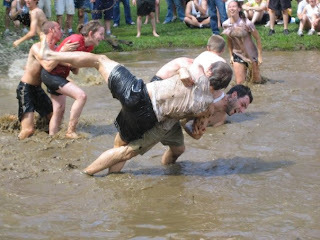 This is me getting owned by Mark at our Spring Retreat with GTCCF in mud wrestling. After interning Mark moved down to Santiago, Chile to serve college students in a campus ministry there called El Oasis. Mark and Elisabeth were married and continued to serve down in Chile until the Spring of 2010. Since then we had kind of lost touch, but a new job brought them over to Stuttgart, Germany for a few months for a training program. It was great to see them and catch up, especially since it was so random that our paths crossed in Germany of all places. We spent a weekend in Frankfurt, giving them the usual tour and just enjoying the company. Mark and Elisabeth visit Mainhattan! These ladies are certainly excited about the Women's World Cup with the final match being played in Frankfurt. Even guys get excited about the World Cup action. We're demonstrating the proper technique for finishing a header - Wambach style! It was a quick visit, but we really enjoyed the company. We look forward to crossing paths with them in the future, perhaps out in their new home in Portland!